Title text: In competition, you can only play a name if you know who the person is. No fair saying "Frank ... Johnson. That sounds like a real person! Let me just Google him real quick." Took me a moment to get what I was looking at. I forgot there's an actual game you can play with domino tiles. In the Washington section, I thought "This would be a great place to play George Washington Carver. I wonder if he allowed for three-word names?" Then I saw Olivia Newton John and Long John Silver. Do you get bonus points based on the number of words on each domino? Matching Garnet with Ruby and Safire seems a bit of a stretch. Under those rules Chevy Chase would be a match for Harrison Ford. Judges? This is really hilarious. My favorite has to be Super Grover. That really makes me happy! Jack Ma and John Adams is a head-scratcher too. Isn't this a 2-dimensional projection of the N-dimensional "6 Degrees of Kevin Bacon" ? Also - Wheel of Fortune's common feature, "Before and After"
Heimhenge wrote: Matching Garnet with Ruby and Safire seems a bit of a stretch. Under those rules Chevy Chase would be a match for Harrison Ford. Judges? Garnet, I assume, refers to the character who is a fusion of two other characters named Ruby and Sapphire. Jorpho wrote: Jack Ma and John Adams is a head-scratcher too. "While Jack is now a proper name in its own right, in English it was traditionally used as a diminutive form of John"
I actually wasn't aware of that myself, interesting. And by extension, Jean, eg. in the case of Jean-Louis "Jack" Kerouac. I have a bit of an interest in odd diminutives due to a particular website I contribute to. One of the ones that looks silly now is Lol for Laurence / Lawrence / Lowen, as in the case of Lol Coxhill, Lol Tolhurst etc. Also Lol Creme of 10cc/Godley and Creme. Aleister Crowley’s name is misspelled. I think my favorite match was the "full match" (side-by-side dominoes) for "Rich Little" and "Little Richard." (Haven't yet confidently read the whole set, so I might have missed her elsewhere, but…) I was disappointed that there was no obvious room to put Bonnie Parker by the other Parkers I somehow found myself attracted to. If you allow those, I insist on being permitted to play Dan Quayle and Danny Partridge. SomeGuyNamedDavid wrote: "While Jack is now a proper name in its own right, in English it was traditionally used as a diminutive form of John"
Yeah, I'm fond of saying "Jack is short for John" to highlight the insanity of it. I once watched a documentary in which people were referring to JFK as "Jack", which wasn't in the least bit confusing given his wife was Jackie. I'm pretty sure they even called him "Jackie" at some point, though I might have lost the plot by then. ETA: This is an xkcd classic, BTW. The Chinese version will be great. Indeed! Rubies and sapphires are gem varieties of corundum (Al2O3) while garnet ((Mg, Fe,Ca)3(Al,Fe)2(SiO4)3) is a completely different mineral. They aren't even in the same minerological group! Jack is a nickname for John. No scratching, head or otherwise, required. I like the Jack White - Meg White - Meg Ryan - Jack Ryan square. And the Yo Yo Ma - Ma Rainey - Jack Ma - Ma Bell pinwheel. Between Steven Colbert and James Earl Ray is Steve Earl. You got something against hillbilly music? I thought there was a good chance there was a more significant connection between Ayn Rand and Rand Paul, but apparently not. Despite his father's libertarian views and strong support for individual rights, the novelist Ayn Rand was not the inspiration for his first name. Growing up, he went by "Randy", but his wife shortened it to "Rand". pernishus wrote: Growing up, he went by "Randy", but his wife shortened it to "Rand". I don't know if it's good or bad that his wife doesn't really consider him to be as Randy as he once was. The bottom right corner (Tommy Lee and Tommy Lee Jones) was as I expected when I saw the shapes. I don't recall ever playing dominoes with some tiles 3/2 the length of others, though. 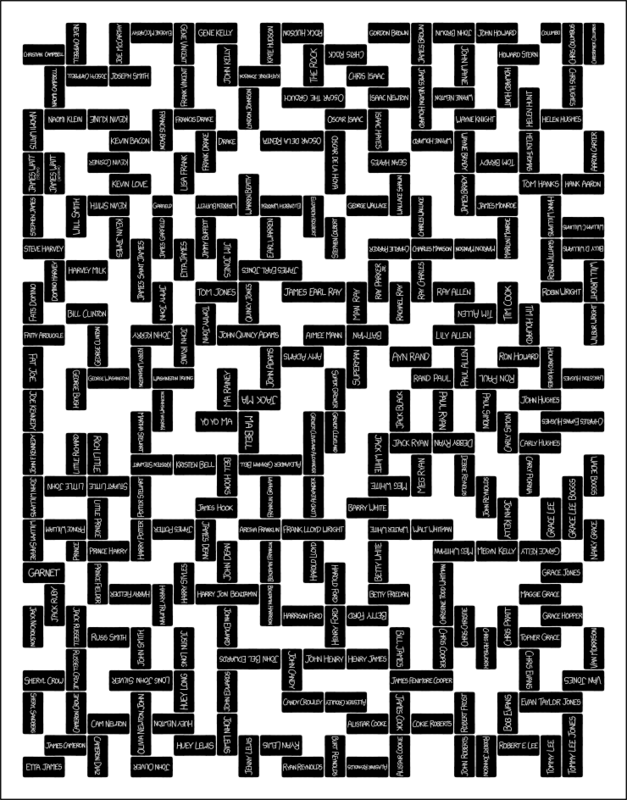 Zoomed out or in a thumbnail, this comic looks suspiciously like a matrix barcode. Do you get points if the tiles spell someone's name? That would be awesome.